The town of Henderson is located 16 miles north of Denver. 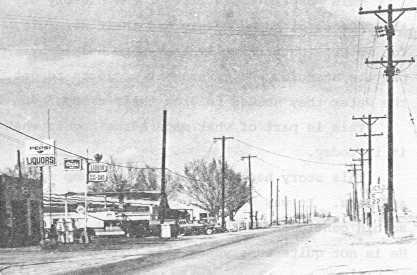 Years ago Henderson was a small town community, but today the town is considered a farming community. About half of the original Henderson Island exists today, the other half has been covered up by the South Platte River. Henderson received its name from Jack Henderson who bought the island in a bar for the sum of two barrels of whiskey. Jack had ideas to set up a post where western bound people could pick up needed supplies and food. When Jack bought the land he started building his trading post with the help of a couple of friends, Jim Saunders and William Roland. 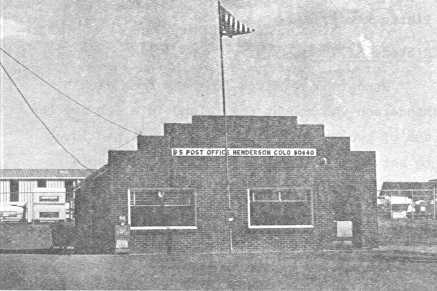 The post consisted of a cattle coral, a hotel, a bridge, and a ranch house. damages to make the building usable again. Mrs. Bishop still owns the hotel and lives in Henderson. Jack was a Colonel in the Boarder Wars of Bleeding Kansas. Moving to Colorado he set up the town Henderson which had two other names Henderson Island Station and Henderson Island. adventurer, and a man with a special ability to make money off of his thinking. The town of Henderson will always be remembered for the man he was. But Jack was a man of determination, so he bought a chain of gold mines and on one of his visits to Colorado he and eighteen others were slaughtered by a group of Osage Indians because they had crossed their territory with loaded weapons. Henderson has a population of about 150 people that mostly consists of elderly people and farmers. The most recent addition near the town was in 1959 when the Adams County Poor Farm was bought and built the Adams County Fairgrounds. This improved the reputation of Henderson because the town was located near the former Poor Farm. Henderson has had many changes since Jack first built his dream house and all the history of the past makes up the present farming community known as Henderson, Colorado.